My husband gives 110 percent to whatever he does. So, it doesn’t surprise me to hear that he was injured on the SV Spirit of Juno in Barbados. He’s doing the Mount Gay Rum Round Barbados Race with Ondeck sailing. 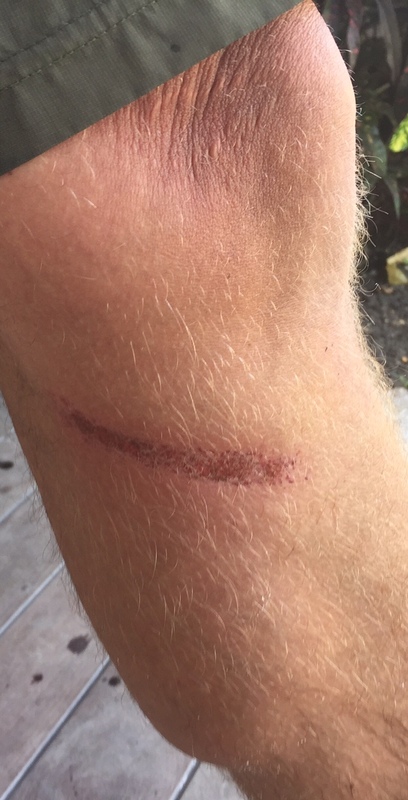 Here is a picture of the rope burn that my husband sustained while sailing. Rope burn. No really. He’s fine. He didn’t realize that he had a rope burn until the next day. He thought he had a sunburn. He will disagree with me, but I know of no one else with his focus or competitive spirit. If he doesn’t injure himself gardening or reading then he just isn’t trying hard enough. He says that the sail racing is stressful and everyone has a job to do. He is determined to learn to sail competently and focuses on his task – whatever the skipper asks him to do, he does. One of his jobs is to operate the coffee grinder winches, which are needed to raise and lower the sails. These winches have two handles that sailors rotate round-and-round in a cycling motion. Another one of his jobs is to stuff the kite sail back into storage. This is how he came to have his rope burn. As background, the kite sail feels like a heavy tent and takes about 20 minutes to pack away. First, it gets lowered into the saloon. It is hot in the hull, and my husband says he needs to time his movements so that he doesn’t get thrown around the boat, which keels and bumps up and down on the waves. On this occasion, the kite sail had just been lowered into the saloon through a hatch, when somehow the halyard line got tangled. Within seconds the halyard ripped the kite sail out of the saloon, back up through the hatch, and sent all the associated lines with it. One of those lines went whizzing by, and took a chunk out of my husband’s leg. He’s fine. At home, my husband cuts all of our wood by hand. He uses an axe and a chainsaw. There are no splitters involved (Thank god!) He fells his own trees, although sometimes using our minivan. A rope burn is nothing in comparison to some of the things I’ve seen. Fortunately, this rope burn really is, just a flesh wound. Boats are cruel. Just changing the oil usually required a blood sacrifice if you expect the engine to run correctly afterward.